I was sitting in a graduate school course some 15 years ago when my professor implored, “People. Do NOT be reactive to your family while you are together over the holiday.” Possibly the best advice any of us could have heard on our way into Thanksgiving break. I’m certain it helped us to tune into gratitude with less reactive distraction over the days that followed. Let’s be honest, while totally wonderful and special, sometimes the holiday flurry of activity, people, sights, and smells, can feel overwhelming. It’s easy to become distracted and to forget about being thankful for the what, where, and who we have in our lives. 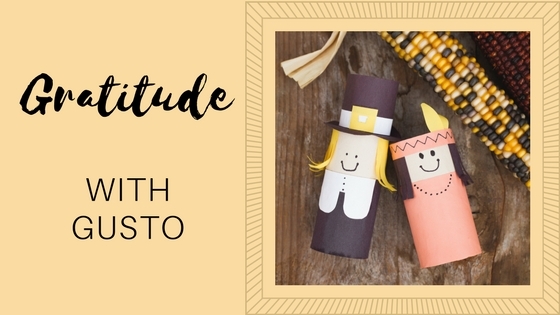 As you enter into your own time with family and friends – a time of being with familiar faces, people you may not have seen for a while, or some you are meeting for the first time, you might want to take a moment to get prepared so you can experience sincere gratitude – with gusto! I offer these tips for maximizing your own experience, and, because everything is connected, the experience of everyone you interact with as well (kind of like Newton’s Laws). It’s part of the human experience and the creative brain to make pictures of the future, or of how we want things to be. Be aware that everybody does this and chances are that everyone’s picture is a little different. What you have in mind might not be what other’s are picturing. Your vision of an ideal Thanksgiving day might be sitting around the table talking and reminiscing while someone else’s vision is of lounging and watching football all day. Suffering is the difference between your expectation and what really happens. If you are overly attached to your expectation and then that expectation isn’t met, you might end up grumbling your way through every bite of your pumpkin pie. Instead, use your intention to turn your expectation into an aspiration and you are bound to enjoy your time together more no matter what happens. You: What am I feeling? What do I want? What do I need? The Other: What might they be feeling? What do they want? What do they need? How do I want to feel when this is over? What is my choice and why? Remember that you always have a choice. What you think about any situation is up to you. If you want to feel better, then choose a thought that will produce that result. You really do have total control over your thoughts. Choose your thoughts wisely and with care. Make room for shades of gray. Family gatherings are full of cherished moments but sometimes buttons get pushed. Give yourself emotional options instead of reacting with anger. There are a lot of other feelings that might more precisely describe what you feel such as disappointment, annoyance, frustration, or simply fatigue. Give yourself the gift of a little insight and you will avoid going off the handle in negative reactivity. Finally, consider digging a little deeper when you remember your blessings. You have arrived at the Thanksgiving table where you sit by way of countless blessings strung together over time. It’s all part of your story. Do yourself a service and embrace your whole story, however difficult or unusual it may have been. It’s yours and it deserves your gentleness, love and respect. So, Happy Thanksgiving to you and yours. May your patience be long, your heart be light, and your gratitude full of gusto.